Of course Brian Wilson has his beard on a Virgin Atlantic plane. Fear the friendly skies. 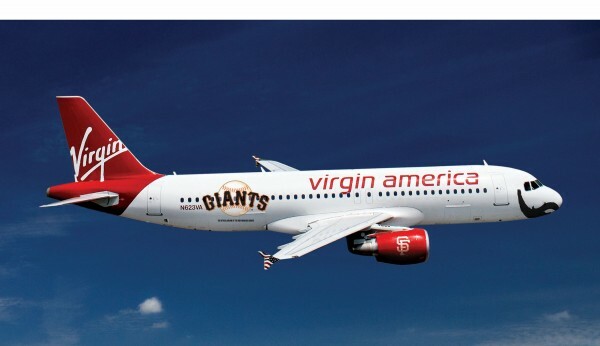 The SF Gate states, “the Airbus A320 is emblazoned with the Giants logo and features closer Brian Wilson’s iconic facial hair on the front of the plane. Virgin is also offering a tie-in contest — folks who tweet photos of the plane are eligible to receive a free flight or Giants tickets. In case you haven’t figured it out yet, Virgin signed a multi-year marketing partnership with the Giants back in 2011.” Nothing Richard Branson does surprises me anymore. Dude’s a billionaire genius. If he wants to put a dumb team on his dumb plane, with a dumb beard on the front of it… more power to him. He’s just a big dumb billionaire. This entry was posted in Baseball and tagged Brian Wilson, brian wilson beard plane, Fear the Beard, Giants, giants plane. Bookmark the permalink.